Healing the body from pain and injury is a process. It takes time, dedication and healthy movement patterns. Yep, it’s that simple. Unfortunately, we continue to live in an era of passive, silly treatments to attempt immediate pain relief. Although these treatments may ease the pain temporarily, they are not actually healing your pain. So, how do we truly heal the body? It has nothing to do with ultrasound, E-stim or an elbow digging in your muscle. Healing the body comes down to one key principle: Healthy Movement. Patient: But those exercises hurt my shoulder. Therapist: Well, we just need to build your strength and work through that pain. Don’t worry, you will finish your session with some E-stim and ice and that will feel good. Think I made that up? Nope. I hear about sessions, treatments and clinics that are run like this all of the time. Ugh. Pain does not heal pain. And, we can do better. Why have we decided to prescribe ourselves to out of date treatments and old habits that don’t give long-term results? It truly is beyond my comprehension. What if we took the time to teach our body how to move well so that we don’t have to function in pain? Our body wants to feel as good as it can and that boils down to healthy movement patterns. What is a Healthy Movement Pattern? I always tell my patients that healthy movement looks the same on ANY body. It’s true. Whether you are lean, short, tall or old, a healthy movement pattern is a healthy movement pattern. What is a healthy movement pattern? It is the efficient, natural way the body syncs our brain and muscles to move well. For every movement in the body there is a correct and organized sequence. Here is an example. Lay on your stomach and lift your leg. What do you feel? Your glute? Hamstring? Lower Back? The correct pattern is that your Glute Max (GMax) initiates the movement before your back or hamstring. Easy. GMax before back/hamstring. This is NOT the pattern most people have in their body, especially if they have pain. Most people initiate with their hamstring or back first. Sometimes the GMax helps but most of the time it never turns on. This is a poor movement pattern. Back/Hamstring before (or without) GMax. Ok, so what is happening to our body that causes this inefficient muscle sequence? 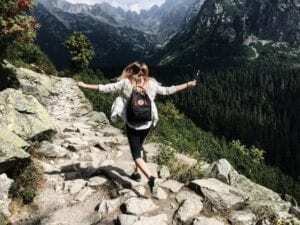 In a healthy state, our brain is able to use our natural movement strategies without much effort. This includes function and sport. However, in a painful state the brain is confused. It’s jumbled with a mess of painful messages and it’s not sure what to do. So, it shuts off our healthy stabilizers and tries to use BIG strategies for stabilization. Big strategies? Muscle patterns we use for pushing, pulling and lifting. Most of us have experienced some sort of neck pain. When we have neck pain, what is that one muscle that ALWAYS get tight and painful? Yes, the Upper Trapezius. 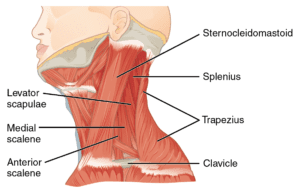 And, the Sternocleidomastoid, Levator Scapulae and Scalenes usually get involved too. These neck “movers” are trying to “stabilize” your neck. This is a hot mess. Bottom line: In a painful state your neck thinks it might be pushing, pulling or lifting. So, what can you do? How do you reorganize and re-pattern your neck for healthy movement and pain relief? That’s right…healthy movement. You would need to kick on those healthy neck stabilizers and relax the neck movers. Important Note: Most passive treatments have their merit and goodness. However, they should NEVER, EVER be a stand-alone treatment. Getting trigger point release, dry needling or massage will never be the answer. Every passive treatment MUST be followed up with healthy movement. Our profession teaches your body how to restore healthy movement using the brain-muscle connection. Let’s consider that Prone Leg Lift from before. Maybe you do use your back before your GMax. And, maybe you do have back pain. How do you re-educate the body to use the GMax first instead of the back? Do more squats and deadlifts to engage the Glutes. Practice lifting the leg on your stomach often until your brain figures it out. Run every day to turn on your Glutes. 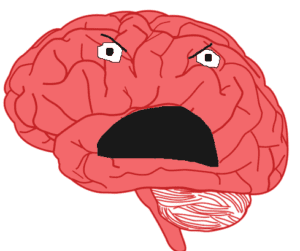 Visit a Physical Therapist and have them teach you how to re-pattern your brain. Apply ultrasound and E-stim to the back muscles for relaxation. Would love to hear your answer below. I hope it makes sense now that the only way to actually re-educate your body out of pain is through healthy movement. 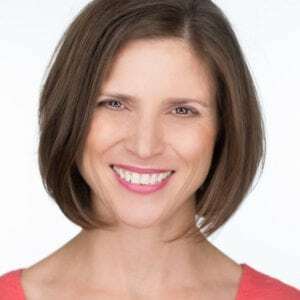 Lori Duncan, DPT, MTC, CPT is a respected Physical Therapist, Manual Therapist and Pilates instructor in Lafayette, CO and the owner of Duncan Sports Therapy and Wellness. Lori is passionate about preventive physical therapy and education and is a nationally recognized presenter. She can be reached at [email protected] You can also follow Duncan Sports Therapy and Wellness on Facebook & Instagram for more free tips and information. Hodges PW. Pain and motor control: from the laboratory to rehabilitation. J Electromyogr Kinesiol. 2011;21(2):220-228. Hodges, PW and Tucker K. Moving differently in pain: a new theory to explain the adaptation to pain. Pain. 2011;152:S90-98. Jull GA, Falla D. Does increased superficial neck flexor activity in the craniocervical flexion test reflect reduced deep flexor activity in people with neck pain?. Man Ther. 2016;25:43-7. Answer: Visit Lori!!! Lori has been re-patterning my brain and re-educating my body. For some like me it can be a slow process (my brain is stubborn) but we are winning the fight. Hate to think where I would be without her, she is the BEST. Thank you Carol. You are working hard to fix some old patterns, but you are making amazing strides. Thank you for the kind comment. Visit a Physical Therapist and have them teach you how to re-pattern your brain!